You are convinced, you need a pillbox to organize the taking of your medication. But which one to choose? A daily or weekly pillbox? Disposable or reusable? With removable modules? One that can be used in treatments with sachet, tablets, capsules, granules? If you are a chronic patient with polypharmacy or not, medipill pillboxes can meet your needs for cardiovascular diseases, diabetes, HIV or simply taking your contraceptive pill or your dietary supplements. 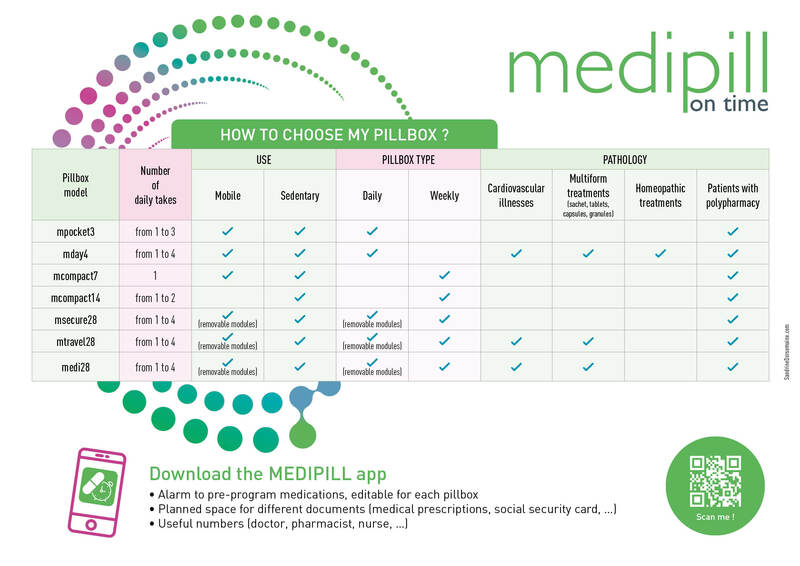 Thanks to the table below Medipill offers you the possibillity to find the pill box you need. Guaranteed security: The data of your credit card is directly addressed to the server of our bank without passing by the Medipill server. Customer service: For inquiries and information we are at your disposal in our customer service. Delivery policy: By entering your customer account, you can track your order at any time. Return policy: For your orders placed online, you have 14 days from the moment you receive your order to return it or to request a product change.